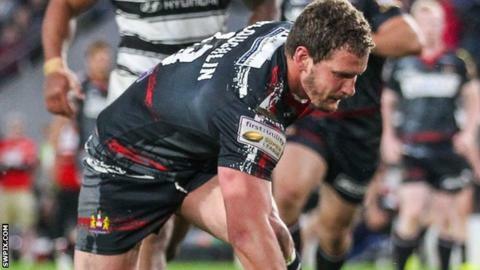 Wigan Warriors' big-game experience will help them during the new Super 8s format, says captain Sean O'Loughlin. The new structure sees the top eight clubs after 23 Super League games enter a seven-game mini-league to decide the four teams to make play-offs. Wigan, who have been in three of the last five Grand Finals, have high hopes for the top four having finished third. "I think over the past few years in big games, we have reacted well," O'Loughlin, 32, told BBC Sport. "We'll try to rely on those experiences as we go into this top eight. When our team is at this point, everybody's game improves and the pressure of picking up wins is massive." Despite one win in their first four games, the Warriors rallied to lie just two points behind leaders Leeds at the start of the Super 8s. What happens now in Super League? The 24 teams in the top two divisions of 12 - Super League and the Championship, split into three groups based on league position. The top eight Super League teams carry their points over. The top four after all eight teams have played each other against contest semi-finals for a Grand Final spot. In The Qualifiers, Super League's bottom four and the Championship's top four teams battle for the three automatic places in Super League next season. The two teams in fourth and fifth play off for the final Super League place. O'Loughlin, who missed three months with a knee injury earlier in the campaign, has played 12 games for Wigan in 2015, of which only three have been lost. However, he was part of the club's 16-12 defeat by Hull KR in the Challenge Cup - a defeat that sharpened their Grand Final ambitions. "We had a reasonably early exit from the cup, so that put our focus solely on getting the top spot and trying our best to get to the Grand Final," O'Loughlin said. "We've not hit the top yet but there are seven games for us to have a good crack at the Grand Final again." What are rugby league's Super 8s?